Fig. 590 and Fig. 591 Multi-Jet Barometric Condensers are generally employed where low cost water is available in ample quantity. It is the simplest design of all barometric condensers, and requires no auxiliary air pump or pre-cooler. It is probably the ideal type where load conditions are constant and there is little air leakage. The Multi-Jet Barometric Condenser is also used where the vacuum handled is not high and a moderately large terminal difference is permissible. Fig. 592 Multi-Jet Spray Type Barometric Condensers are generally employed where large capacities are required and where wide fluctuations in water temperature or steam load occur. The flexibility of operation achieved by this condenser is apparent from its design. For full vapor load the rated water capacity is passed through both the spray and jet nozzles. If the load or water temperature decreases, it is possible to throttle the water to the spray nozzles and ultimately turn them off completely. In the latter case, the condenser is operating similar to the Multi-Jet type, but with a minimum of injection water under the given conditions. Fig. 594 Multi-Spray Barometric Condenser was developed primarily to solve condensing problems where water supply is limited, it is also well suited in operations where water temperatures are high in relation to vacuum requirements, or where a large volume of non-condensables must be removed. Vapor enters the condenser at the top and is thoroughly mixed with injection water which is delivered through several spray nozzles. The downward action of these converging sprays creates a suction in addition to their condensing action. Vapors condensed in the spray chamber are delivered with condensing water to the hot-well through a barometric leg. As stated, a barometric leg is achieved by way of a tail pipe to drain the water and condensate from the condenser to a hot well at grade. The condenser is normally elevated to a sufficient height to permit this liquid to gravity flow down without any mechanical assistance. The minimum required height of the barometric leg is, therefore, a function of the maximum barometric pressure at the plant site and the operating (vacuum) pressure inside the condenser. As an example, let's assume the maximum barometric pressure at a plant is 30" HgA and that the condenser is operating at 4" HgA, then the minimum required height of the barometric leg is a liquid column equating to 26" Hg. As 1" of Hg equals 1.133 feet of water, a minimum barometric leg of 29.5 feet is required. Note that this is the 'minimum' barometric leg height. It's normally recommended that a 34 foot barometric leg be provided which allows the system to pull a pure vacuum and still allows the water and condensate to drain freely. The tail pipe of the barometric leg should be vertical with no horizontal bends. There should be a minimum of gasketed joints or welds in the tail pipe to minimize leakage potential. It must be "sealed", that is, the outlet of the tail pipe must be at least 6" below the minimum level of the water in the hot well. Barometric legs, if improperly designed and installed, can result in reduced vacuum capability. In the Multi-Spray Barometric Condenser, the non-condensables are drawn through an air suction chamber to a pre-cooler, where water delivered by a spray nozzle lowers the temperature of the air-vapor mixture and condenses practically all of the vapor. The remaining mixture delivered to the air pump is at a temperature close to that of the spray water which reduces to a minimum the amount of condensable vapors removed by the air pump. Fig. 597 Barometric Counter-Current Condensers are used where water supply is limited or an excessive amount of non-condensables requires the use of a separate vacuum pump, and local conditions necessitate a side vapor inlet. Fig. 597 Barometric Counter-Current Condensers are the only condenser available in small sizes to meet the requirements of the above conditions. In both the Fig. 597 and Fig. 598 units, injection water enters the condenser through a water nozzle at the top of the unit. A distribution tray in the shell provides a "water curtain" through which the vapor must pass. The spray nozzles are located to provide maximum effective distribution independent of the leveling of the condenser. Most of the vapor entering the condenser is condensed in the lower part of the shell, and the non-condensables are then required to travel upward through the water curtains. 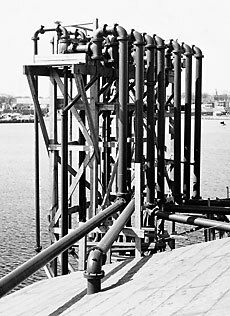 A baffle arrangement is provided at the air suction connection to reduce to a minimum the carry-over of water that may have been entrained as the air passes through the condenser. Fig. 590 and Fig. 591 Multi-Jet Barometric Condenser is economical, low first and installation costs. As with other Barometric Condensers, the Fig. 592 Multi-Jet Spray Type Barometric Condenser has no moving parts in the vacuum chamber. Due to this simplicity of design, high performance with easy operation can be anticipated. The absence of moving parts and vacuum pumps reduces downtime associated with equipment involving moving parts. The Fig. 594 Multi-Spray Barometric Condenser offers a number of advantages in its design which provide efficient performance. The parallel flow design, with top vapor inlet, effectively prevents flooding under all circumstances. Fig. 597 Barometric Counter-Current Condensers have no moving parts. Little maintenance is required and provision can be made for internal inspection of the unit. Because of the barometric leg, no water removal pump is required. Due to efficient cooling of non-condensables, the supporting vacuum pump requires a minimum of live steam for efficient operation. S&K Counter-Current Condensers can be supplied in cast iron or steel plate, as well as most special materials. The construction also lends itself readily to rubber lining. Recommended for operation under fairly constant loads where there is relatively little air leakage, and where water is not too scarce and does not need to be recirculated. Increase efficiency and cut the time required to dehydrate whole fish. Used extensively in canneries, in sugar, milk, and other food plants; in pulp and paper mills, distilleries; petroleum refineries, and a wide variety of chemical and salt manufacturing companies. A typical use of a standard Multi-Jet Spray Barometric Condenser with evaporators. For more detailed information about Barometric Condensers, Bulletin 5-AA Literature. To submit a Request for Quote (RFQ) for Barometric Condensers, Adobe PDF or submit an online interactive RFQ Form for Steam Jet Vacuum Systems. Multi-Jet Spray Type Barometric Condenser with Evaporator. This image illustrates a typical use of a standard Multi-Jet Spray Type Barometric Condenser with evaporator. The steam vapors from the evaporator pass through a separator or catch-all, where any liquid carried in suspension is collected and drained back into the evaporator. The vapors pass on to the top inlet of the condenser where the condensing is accomplished by the spray nozzles. The water jets entrain the air and non-condensable gases and discharge them into the barometric tail pipe which drains by gravity into a hot-well. Condensing water is delivered to the nozzles at a slight positive pressure (4 to 5 lbs. ), but with light steam loads, the injection water may be throttled and water flow adjusted to meet the vapor load. As indicated in the illustration, no air pumps are required and the installation is simple and foolproof. Multi-Jet Spray Type Barometric Condenser in Spray Pond Arrangement. In cases where there is a shortage of cooling water, it is necessary to apply a re-cooling system. This is done effectively by a spray pond arrangement, as shown. Two centrifugal pumps are employed; one for delivering the warm water from the hot-well to the spray pond, the other for pumping the cooled injection water to the condenser. Automatic level control is provided by an overflow pipe from spray pond to hot-well.